Having a deep understanding of your competitor’s online marketing strategies is a big part of ensuring that new customers are finding your business or brand first. In this post, I’m going to review a few of the best paid and free competitive analysis tools that will help you identify gaps, strategies, and stay one step ahead of the competition. SimilarWeb has become a staple tool for competitive analysis. This robust tool allows you to analyze multiple areas of your competitor’s online marketing strategy and compare it to your own to find gaps and opportunities. I use SimilarWeb to help me understand where I should spend my time, i.e. which channels and strategies I need to investigate further. Here are just a few examples of reports you’ll find in the free version of the tool, along with the insight you can glean from each. All Visits – use this report to see your competitor’s estimated traffic in the last 6 months from all channels. Has their traffic increased, remained stable or decreased? Regardless of the answer to the question, the next question should be why? Engagement – this report provides time on site and bounce rate which can provide insight into the experience competitors are providing visitors. Search engines use search quality metrics to help them assess whether or not a webpage is a good answer for a query. Working to become a destination, providing a great user experience, and being the best answer for the keywords your site is ranking for is important. Traffic Sources – use this report to measure where your competitors are getting their traffic. Are they outperforming you in organic search, and if so, what keywords are driving these visits? Referring Sites – use this report to see what websites are referring the most traffic to your top competitors. Are they affiliates, partners, or relationships with other websites you should be pursuing? Organic Keywords – use this report to evaluate what keywords are sending the most organic search traffic. I love this report as it oftentimes will contain a phrase that is generating impressions for a post or page on a competitor’s website that can generate new content ideas for your own website. Paid Keywords – use this report to evaluate what keywords are valuable enough that your competitors are willing to pay money to be seen for? This report can oftentimes provide insight into what keywords are leading to conversions (sales) for your competitors. Social – As social profiles and content continue to increase as a touch points on the path to purchase across many industries, understanding what social channels are driving the most traffic is important. If a competitor is receiving a substantial amount of social traffic from Facebook, I’d want to know what types of content they’re posting, when, and how frequently? These are only a few of the reports you can access with the free version of SimilarWeb that can provide insight into where you need to be digging deeper into specific strategies. One way to utilize Google Search for organic competitive insight and analysis is to use the advanced search operator link:, to see where your competitors are getting backlinks. 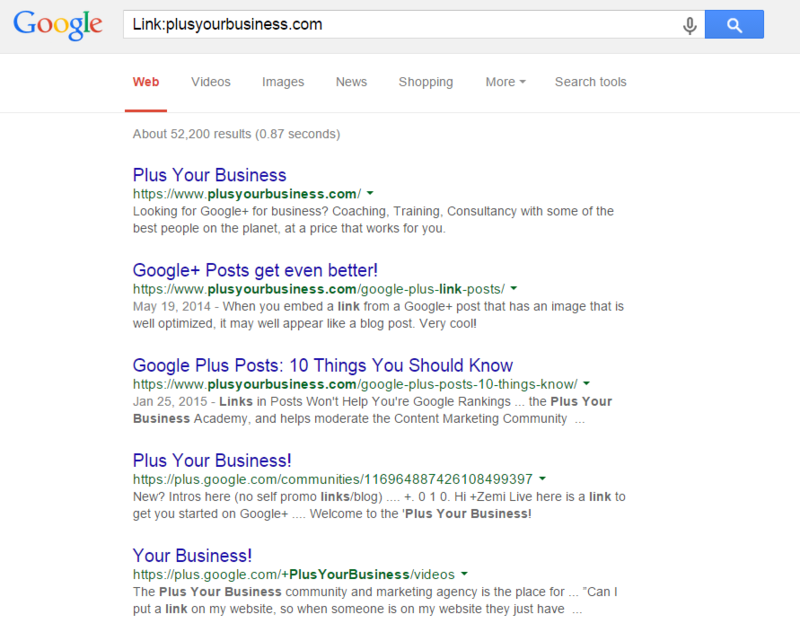 The below screenshot shows a link search for the Google+ for business resource site, Plus Your Business. We can see in the above screenshot that Google is returning many links from Google+ for the website. While Google’s ranking algorithm contains over 200 factors, links still play a large role in helping Google evaluate the overall reputation, trust, and visibility of a website. Use this free tool to see the relationships your competitors have built that you should also pursue. Remember, some of the most valuable inbound links are ones on 3rd party websites that serve your target audience, and that send qualified referral traffic back to your website. Awesome right? Other cool features are the ability to set-up alerts, filter by date and by type (articles, infographics, interviews, videos, etc.). While the tool does allow for some free insight (ten results for a search) for registered users), you’ll need to upgrade to the pro plan to really take advantage of all the available features. Organic keywords – use this report to see the top keywords, their ranking position and search volume that are driving Google organic search traffic to your competitor’s websites. Are there keywords that your competitors are ranking for and sending traffic that are also relevant to your products, solutions or services? Chart Tools – I love this tool as it can be used to evaluate the visibility of both paid and organic search strategies overtime. Did your top competitors see a jump in Google organic search traffic? The data can lead to more analysis to help you uncover the “why” behind any increases or decreases. Pro Tip – Do you see a significant dip in organic search traffic? If so, see if the decrease aligns with a Google algorithm update which may indicate that a competitor was in violation of Google’s design, technical or quality guidelines. SEMrush offers an “Anchors” report that shows you how often anchor text is found in inbound links pointing back to a website. Use this report to look for unnatural ratios of target keywords vs. branded or naked URLs. A natural inbound link profile should a healthy mix of keywords, branded terms and naked URLs. I’m only scratching the surface of the many reports available in SEMrush that will provide insight into multiple facets of a competitor’s paid and organic search strategy. My advice: play around with the tool and report back on ways you’re using it to flesh out competitor strategies! Pro Tip – If you did see an uptick in Google organic search traffic around a specific time period, use archive.org to see if any changes were made to their pages around that time. Also be sure to check out the press section of a competitor’s site to look for any partnerships, acquisitions or campaigns that align with an increase in organic search traffic. In addition to setting up alerts for your own brand name and target keywords, you’ll also want to set-up alerts to keep an eye on what your competitors are up to. Use Google Alerts to see where your competitors are getting links and mentions. 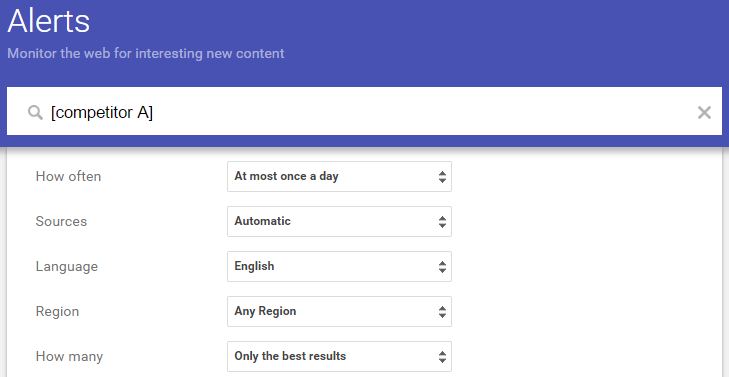 Pro Tip – Google alerts can also be used to help with new content ideas, link acquisition for unlinked brand mentions, guest post opportunities, and to discover new topically relevant content to share with your community across your social media platforms. These are just a few tools you can utilize to track the performance and digital marketing strategies of your top competitors. I’d love to hear about the free/paid tools you use for competitive analysis and research in the comments below. Brian Jensen is the Founder & CEO Congruent Digital, is a founding member of the Plus Your Business Academy, and helps moderate the Content Marketing Community on Google Plus. You can connect with Brian below. Ready to grow your online presence?